in order to understand how processes share the CPU. such as Process and Scheduling. To use this simulator, you need to know some commands for handling a world of ProcessSimulator. After starting the simulator, the input shell are appeared. 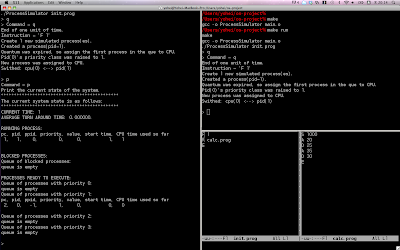 - CPU consumes 1 instruction from programs, and execute it. - If there is a blocked process, move its state from Blocked to Ready. P: Print the current state of the system. - The state include PC, PID, PPID, Priority, Value, Time, etc. T: Terminate the system after printing the current state. - The printing is same as 'P' command. *1 The capital or not does not matter (q, u, p, and t are also accepted). *2 You can read the command description above when you type 'help'. When you type Q command, 1 instruction in a special program is executed. S n: Set the value of integer variable to n, where n is an integer. A n: Add n to the value of the integer variable, where n is an integer. D n: Substract n from the value of the integer variable, where n is an integer. B: Block this simulated process. E: Terminate this simulated process. execution n instructions after the next instruction. filename, and set program counter to the first instruction of this new program. processes share a CPU by the scheduling policy. The scheduling policy used in the simulator is FIFO Queue with priority. When context swiching happens, the process in the Ready State queue is dequeued. Then, the process is assigned to the CPU, and it can use CPU for some ticks. the context switching happens again, and the next process in the queue will be assigned. Process Simulation issues 2 main processes, Commander and Process Manager process. the process immediately sends it to Process Manager process. synchronizes by using pipe(), which is one of the experimental challenges in this program. no longer used, and then it stops sleeping and executes the next instruction. As a result, pipe serves as a synchronizing organization. You can read the specific code of the organization in main.c program. The codes have a comment like "Pipe Synchronization". For futher information, please read the "spec.pdf" file. 2. How to run Process Simulator? To run the simulator, you need the following envrionment. you can run the simulator by typing following commands in your terminal. In default configuration, 'init.prog' are read as an initial program to start. If you want to read other program instead, please type the following command in your terminal. Then, the targeted program determined by the command line arguemnt is read as an initial program. The program name does not need to have ".prog" extention. In Process Simulator ver 1.0, the following problems were discovered. Part of or all of them will be fixed in the next update. - 1. Problem occurs when the program does not end with E instruction. - 2. Over maximum number of process(256) stops the system. - 3. Over maximum number of instructions in a program(64) stops the system. - 4. Over maximum number of inputs(256) stops the system. please visit the following website. Or, please clone the code by typing the following command. To clone the code, you need to install Git in advance. This section explains how Process Simulator runs with an example. We use init.prog and calc.prog as example programs. the following is the process from start to end of the execution. 1. pid=0: F 1 pid=1 is created (Start from 2nd tick). So, Average Turn Around time is 5 ticks. you can see when you actually run. End of one unit of time. Create 1 new simulated process(es). Quantum was expired, so assign the first process in the que to CPU. Pid(0)'s priority class was raised to 1. New process was assigned to CPU. 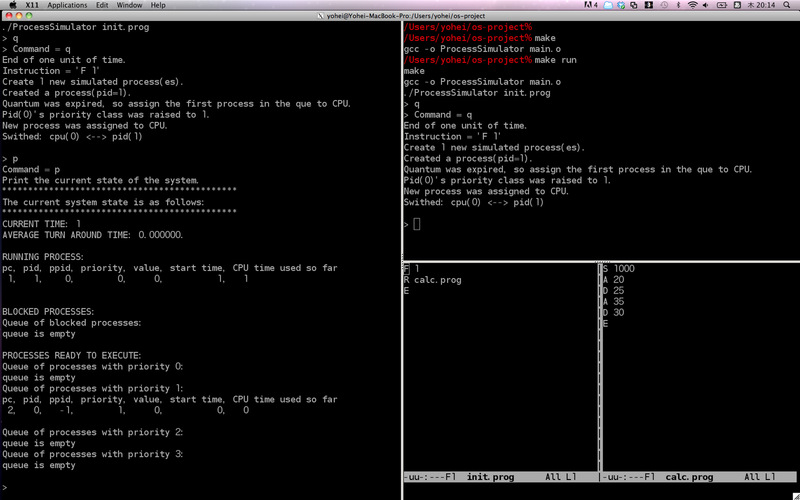 Replace the program of the simulated process with the program in the file 'calc.prog'. Pid(1)'s priority class was raised to 1. There are no process running, so assign the first process in the queue to CPU. Set the value of the integer variable to 1000. No ready processes, so continue to run the current process. Add 20 to the value of the integer variable. Substract 25 from the value of the integer variable. Add 35 to the value of the integer variable. Substract 30 from the value of the integer variable. AVERAGE TURN AROUND TIME: 5.000000.